SUMATRA 2 5D/4N ADVENTURE Tour Day 1 : KNO - Medan City tour - Bohorok / Bukit Lawang Welcome upon arrival at Medan Kuala Namu airport, meet and greet then drive for about 2 hrs to Medan. City tour visit Maimoon Palace and Chinese Temple. 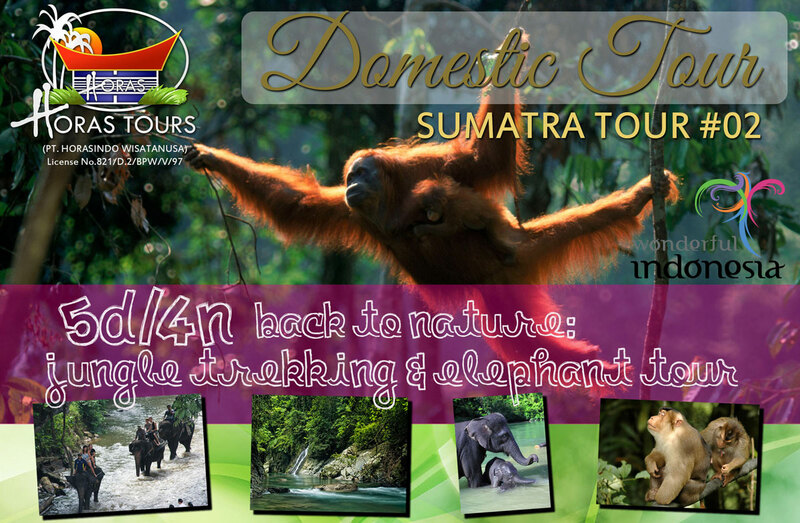 Continue driving north-westward for about 3 hours to Bohorok, orang utan center. En route pass by several small towns in the midst of vast rubber and oil palm plantations. Stop to see palm oil plantation from outside. If it’s in season you can stop to see local “rambutan” and cacao garden, also stop to see local market in Kuala. Arrive in Bukit Lawang, check-in at hotel. Free program. Day 2 : Bohorok / Bukit Lawang visit orang utan feeding Morning after breakfast take on another trekking to the orang utan station to watch the orang utan feeding. Walk down about 25 minutes to the river then cross by dug-out canoe to the gate of orang utan station. Then hike up another 25 minutes to the feeding station. Watch the process of orang utan feeding at 08 am. The orang utans are free animals and cannot be booked in advance. Sometimes in fruit season when there are many fruits in the jungle they might not come to the feeding center. After watching the feeding process return to hotel for overnight. Day 3 : Bohorok - Tangkahan Depart for Tangkahan on a rocky and dusty track passing through palm oil plantations and wonderful sceneries. Arrival in Tangkahan, a remote outpost deeper in the national park. Cross the river on a “sampan”, local wooden ferry and then walk on a small trail for 15 min to the lodge. Check in to your simple, yet very hospitable, accommodation and enjoy the day at leisure. Relax and unwind in the clear water river of Tangkahan. Have a swim in the nearby Garut river waterfall. Overnight in lodge. In the evening enjoy the peaceful surrounding of the jungle with lots of bird sound. If you are lucky, the staff may even bring out their guitar and sing local songs to you. Day 4 : Tangkahan - elephant washing and 1 hour elephant trekking Breakfast. Walk about 15 mins to the Elephant Center. Tangkahan outpost has been created by local and foreign NGOs to patrol the jungle against illegal loggers and poachers, and protect the national park neglected by the authorities. The patrols are conducted once weekly and on elephant back. Assist to the elephants bath down in the river and help the rangers scrubbing and feeding them with bananas. After washing the elephants, start trekking in elephant back accompanied by an experienced mahout for one hour. One elephant will be shared by 2 people. Back to hotel, free program. Day 5 : Tangkahan - Medan - KNO apt +/- 6 hrs drive After breakfast drive about 4 hrs back to Medan via plantation roads and small town. From Medan continue about 2 hrs drive to airport. Arrive in apt, end of tour.